Explore California's capital city from Sheraton Grand Sacramento Hotel. 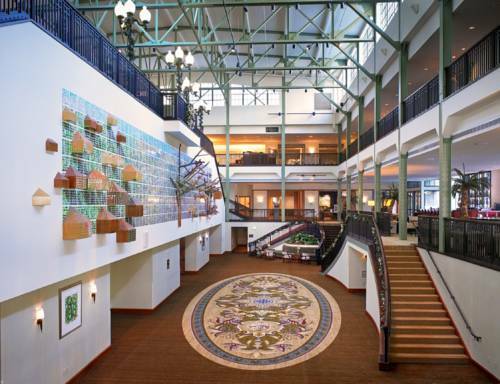 Located inside the beautifully restored Public Market Building, our downtown hotel places guests near the Capitol Building, the Sacramento Memorial Auditorium, and the Convention Center (just across the street). Recharge in our modern, pet-friendly hotel rooms and suites which offer amenities like flat-screen TVs, large bathrooms, ample desks, Wi-Fi and Sheraton Signature Sleep Experience beds. Club-level rooms grant access to Lounge perks, including free breakfasts and Wi-Fi. Upgrade to a suite to benefit from separate living areas, sofa beds, mini-refrigerators and bay windows with amazing Sacramento views. Dine on delicious California cuisine and libations in Morgan's Restaurant or the Public Market Bar. Take a dip in the heated, outdoor pool or work out in the 24-hour Sheraton Fitness. Our elevated venues, expertly supported by catering, planning services and technology, are ideal for weddings, conferences and social events. Public Market Bar: Known for its downtown-cool vibe, Public Market Bar is ideal for socializing and networking. Set near the Sacramento Convention Center, our hotel bar offers a delicious restaurant menu of California cuisine, specialty beverages and an extensive wine list. Morgan's Restaurant: Begin your day with a delicious breakfast buffet and la carte offerings at Morgan's Restaurant. This welcoming spot sits in our Sacramento hotel's atrium and tempts guests with seasonal California fare, using a farm-to-table ethos.